Junior Accountant’s roles and responsibilities are to provide financial information by handling, maintaining and reconciling the related accounts. The other primary tasks for the Junior Accountants include – posting and processing journal entries, updating accounts receivables, accounts payable and issue invoices, performing reconciliations, assisting in drafting of balance sheet, income statements and financial statements; assisting in reviewing of expenditures, payrolls and records; updating financial data into accounting software, preparing and submitting weekly and monthly reports, assisting senior accountants in preparation of year-end closing statements and assisting in all other accounting projects. Graduates in the field of accounting, Finance or the relevant are normally hired for this job position if the respective Junior Accountant Resume showcases skills and qualifications such as proven experience as a junior accountant, a good understanding of accounting and financial principles, and excellent knowledge of MS office on relevant software like SAP. Summary : Junior Accountant I with 11 years of experience is seeking a rewarding position with a progressive company where my experience and skills may be utilized to make a positive contribution to the organization. Accounting/Payroll System Expertise ADP Ceridian 500 Deltek Cost Point Deltek Time & Expense Epic GCS Premier and Report Smith NFC (National Finance Database) Star Unanet Time Collection QuickBooks Pro 2006 Platform: Windows 2000 Software: Microsoft Office; WordPerfect 9. Managing all aspects of CMIs payroll (a government contractor with 800 employees) using Deltek time & expense, GCs premier, and ADP. Analyzing & preparing the bi-weekly and semi-monthly transmission of payroll. Ensuring accuracy and timely processing of all payrolls, prompt and courteous service to the CMI employees and clients. Editing and processing the employee time records and entering information from time & expense to GCs. Analyzing, reconciling and resolving all employee payroll issues to ensure smooth payroll processing. Ensuring payroll reporting and payments are compliant with company policy & state and federal rules and regulations. Implementing wage garnishments, adjusting payroll records, and transmitting the withholdings. Processing payroll adjustments and corrections received from the billing department. Ensuring that all checks are received and distributed appropriately and on-time at the proper locations. Preparing and maintaining the monthly list of manual checks, terminations and adjustment transactions with supporting documentation. 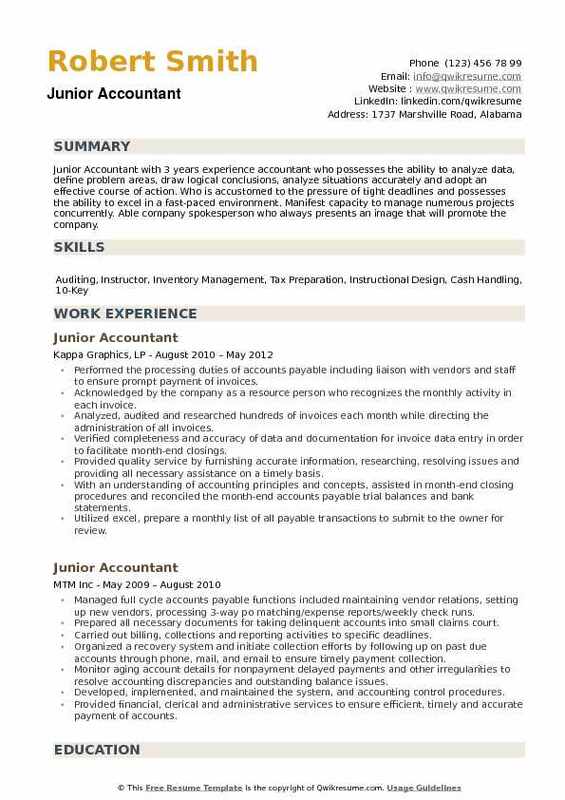 Headline : Junior Accountant I with 7 years of experience is responsible, hard-working seeking a full-time administrative, support or accounting position in a friendly environment. Skills : Organizational, Analytica, Reporting, Accounting Principles, Billing, Accounts Payable, Accounts Receivable, Payroll And General Ledger. Responsible for all aspects of accounting for our philanthropy division and assisting and supporting the Chief Financial Officer. 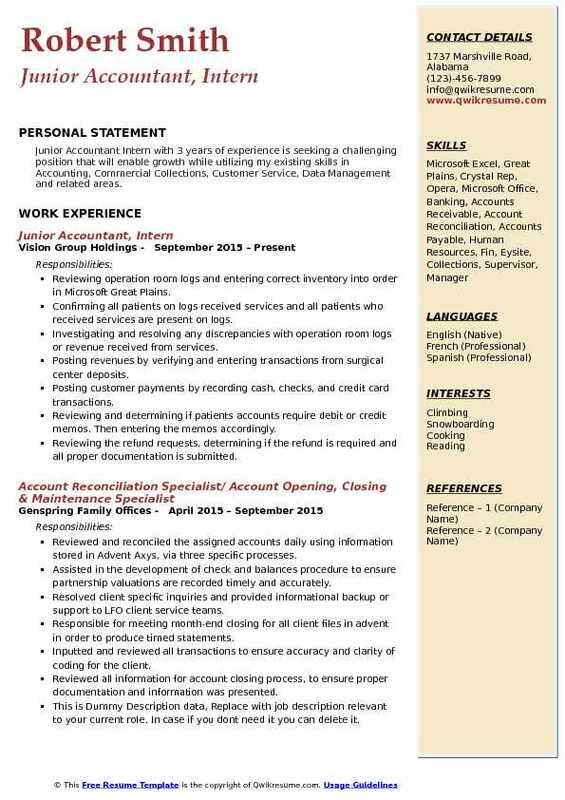 Accounts payable duties including receipt of invoices, coding for appropriate expense disbursement, data entry. Preparing and entering journal entries into Sage MAS90 accounting system. Responsible for timely monthly and annual closing by performing journal entries and reconciliations. Monthly reconciliation of prepaid expenses, deferred revenue, accounts payable, pledge schedules, etc. Tracking and preparing reports of revenue through receipt of cash, credit card, web applications and PayPal. Performing extensive query, reporting, and reconciliation in blackbaud raisers edge fundraising and donor. Reconciling the consignment store daily transactions with close-out reports and bank statements using QuickBooks. Providing documentation and reports as requested and needed, including audits. Scanning and verifying the accounting documentation into onbase alldocs content management software. Assisting with company insurance renewals and maintaining files with pertinent policies and documentation. Coordinating the requests and distribution of certificates of insurance. 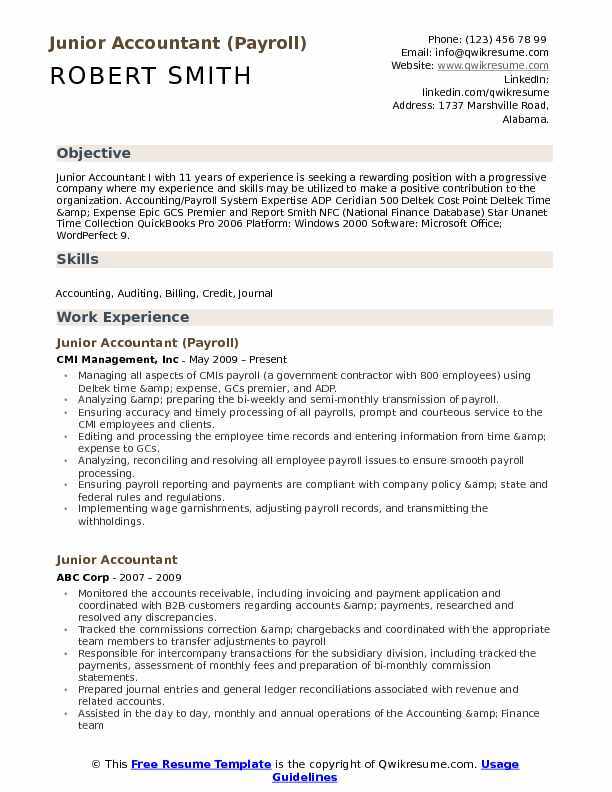 Objective : Presently a Junior Accountant with primary responsibilities being in the area of Accounts Payable. I am familiar with accounting procedures, processes, and a variety of software programs from my extensive experience working in accounting. Maintaining financial records by reconciling balance sheet and general ledger accounts. Compiling and analyzing the financial information to prepare entries to general ledger accounts. Maintaining the general ledger accounts by reconciling accounts receivable detail and control accounts, adjusting entries for amortizations & prepaid. Supporting the department and the organization through research, investigation, and resolution of defined issues and problem-solving with internal and external customers. Preparing any range of recurring reports, gather, extract data from accounting and database systems, analyzing and presenting data to the company's Management. Performing or assisting with any operations, as required to maintain workflow and to meet schedules and quality requirements, notifying the supervision of unusual equipment or operating problems and the need for additional material and supplies. Participating in any variety of meetings and work groups to integrate activities, communicate issues, obtain approvals, resolve problems and maintain a specified level of knowledge pertaining to new developments, requirements, policies, and regulatory guidelines;. Providing administrative support including the preparation of spreadsheets. Skills : Windows Vista, Journal Entries, General Ledger, Microsoft Office 2007, Spreadsheets, Accounting Reports higher. Handled daily A/P processes, managed vendors/supplier relations and oversaw the timely, accurate processing of invoices, purchase orders, petty cash, credit memos and payment transactions. Maintained and managed inventory of ink and paperwork totaling over $10m. Maintained adherence to Corporate Accounting, and GAAP standards. Addressed issues from employees and vendors regarding accounts payables and ensuring accurate and compliant A/P files and records in accordance with company policies and government regulations. Maintained and managed the accurate and timely processing of up to 3,000 invoices ($8m) per month. Assessed and closed A/P sub-ledger on a monthly basis, validated content and resolved purchase order, contract, invoice and payment discrepancies. Maintained and managed vendors account by reconciling monthly statements and related transactions. Resolved any issues rising from the reconciliation. Received goods into our accounting/inventory control system and solved any discrepancies between packing slips and purchase orders. 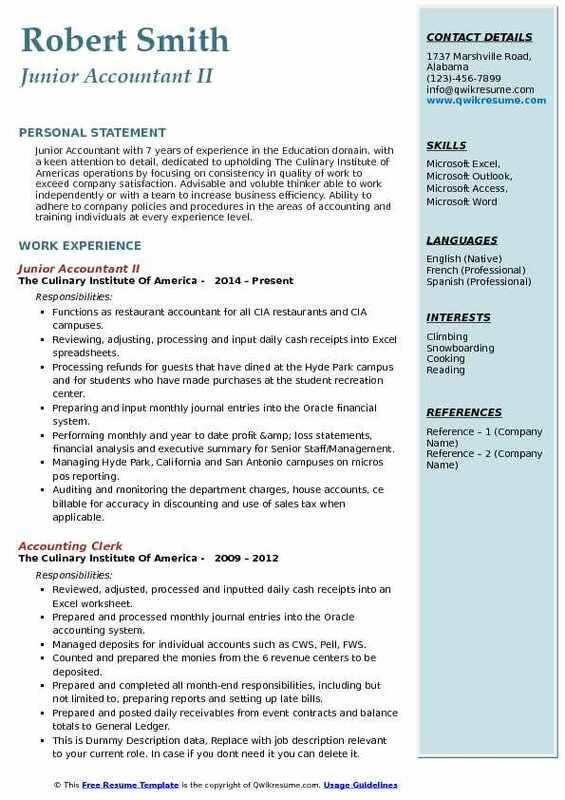 Headline : Junior Accountant with 7 years of experience in the Education domain, with a keen attention to detail, dedicated to upholding The Culinary Institute of Americas operations by focusing on consistency in quality of work to exceed company satisfaction. Advisable and voluble thinker able to work independently or with a team to increase business efficiency. Ability to adhere to company policies and procedures in the areas of accounting and training individuals at every experience level. Functions as restaurant accountant for all CIA restaurants and CIA campuses. Reviewing, adjusting, processing and input daily cash receipts into Excel spreadsheets. Processing refunds for guests that have dined at the Hyde Park campus and for students who have made purchases at the student recreation center. Preparing and input monthly journal entries into the Oracle financial system. Performing monthly and year to date profit & loss statements, financial analysis and executive summary for Senior Staff/Management. Managing Hyde Park, California and San Antonio campuses on micros pos reporting. Auditing and monitoring the department charges, house accounts, ce billable for accuracy in discounting and use of sales tax when applicable. Reconciling the credit cards, gift cards, gift certificates, cash, meal plan and culinary cash to reports from EPS, Amex, TCC and the daily restaurant deposit log. Gathering and reporting the retail sales activity for the yearly chubb audit that is done for the hyde park and California campuses. Working alongside the internal auditor to audit safes that are assigned to the bartenders at hyde park campus. Training new hire controllers at the San Antonio and California campuses how to process the daily sales for the revenue centers using the Micros system. 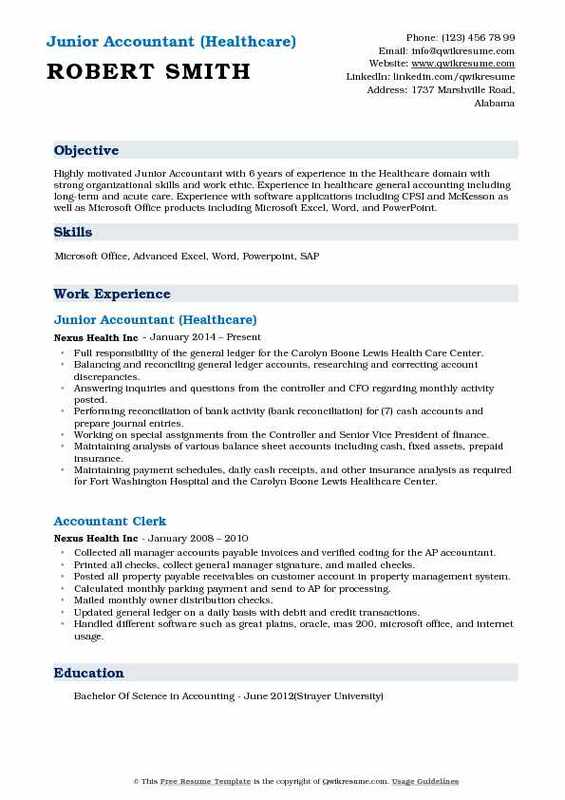 Objective : Highly motivated Junior Accountant with 6 years of experience in the Healthcare domain with strong organizational skills and work ethic. Experience in healthcare general accounting including long-term and acute care. Experience with software applications including CPSI and McKesson as well as Microsoft Office products including Microsoft Excel, Word, and PowerPoint. Full responsibility of the general ledger for the Carolyn Boone Lewis Health Care Center. Balancing and reconciling general ledger accounts, researching and correcting account discrepancies. Answering inquiries and questions from the controller and CFO regarding monthly activity posted. Performing reconciliation of bank activity (bank reconciliation) for (7) cash accounts and prepare journal entries. Working on special assignments from the Controller and Senior Vice President of finance. Maintaining analysis of various balance sheet accounts including cash, fixed assets, prepaid insurance. Maintaining payment schedules, daily cash receipts, and other insurance analysis as required for Fort Washington Hospital and the Carolyn Boone Lewis Healthcare Center. Preparation of journal entries for posting to general ledger accounts. Responsible for daily cash reconciliation, which includes managing the cash process from daily postings through the final reconciliation of the monthly bank statement to the general ledger. Preparation of accrued expenses for unrecorded liabilities of the organization during month end closing. 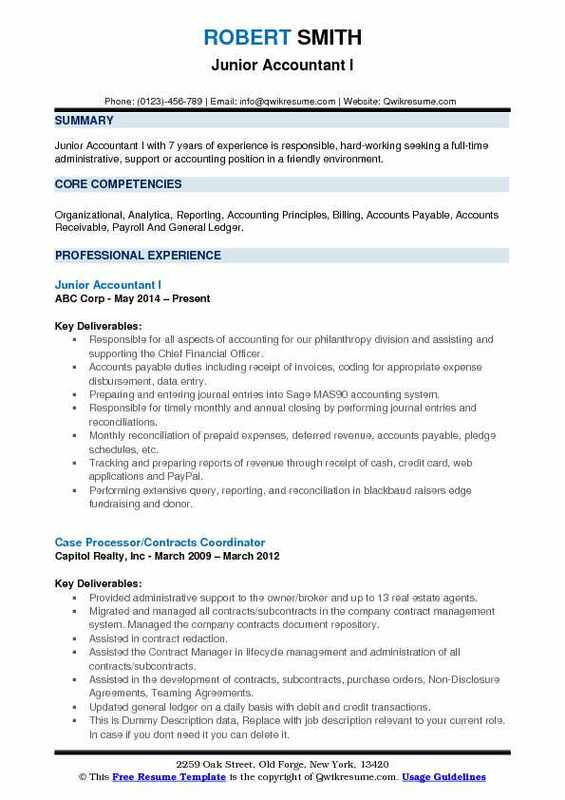 Summary : Junior Accountant with 13 years of experience in the financial services industries of banking, real estate, and investments. Experienced in cash management, investor relations, mortgage processing and on-line banking systems. 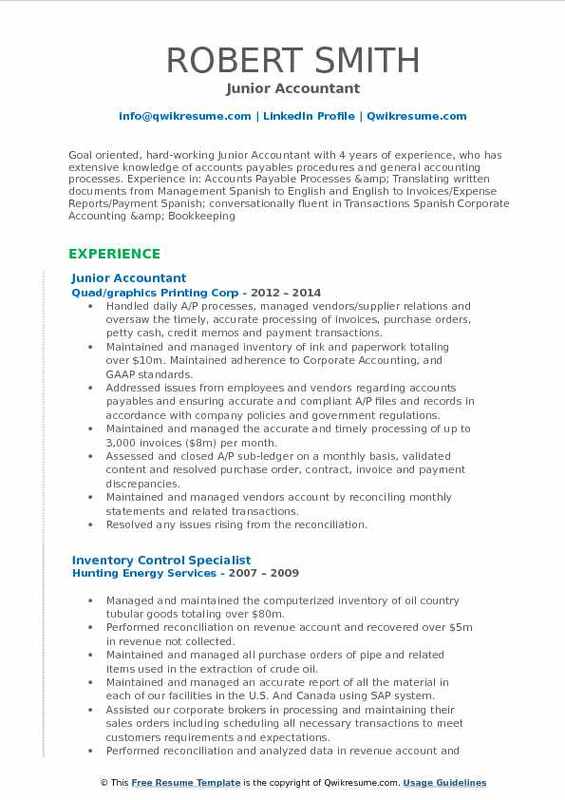 Skilled in balancing bank statements, wire transfers, posting journal entries and audit reconciliations. Processed invoices on A/R & A/P systems. Excellent communication and organizational skills and works collaboratively with a team or independently. Monitored cash balances, prepared and processed completed wires out of three different banking systems along with investing funds of $15m. Implemented and conducted training of all department users and authorized access / log-ins for banking systems. Opened and closed accounts. Collaborated with external banking staff on system updates and changes in a timely manner to current banking systems. 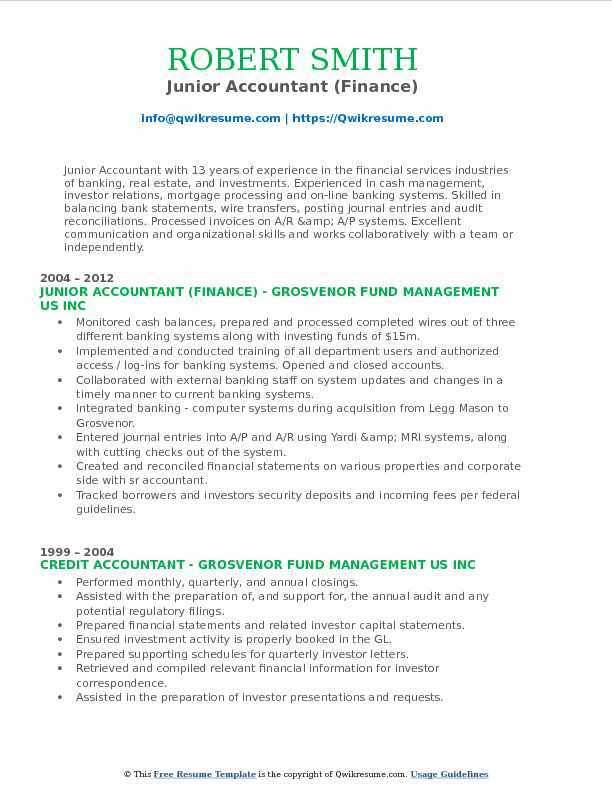 Integrated banking - computer systems during acquisition from Legg Mason to Grosvenor. Entered journal entries into A/P and A/R using Yardi & MRI systems, along with cutting checks out of the system. Created and reconciled financial statements on various properties and corporate side with sr accountant. Tracked borrowers and investors security deposits and incoming fees per federal guidelines. Assisted with the department revenue budget-estimated at $8m through analysis and preparation. Worked with the auditors each year to ensure books balanced and proper back up was in place. Acted as liaison with it department enhancing mri system and reporting to regulatory organizations. Administered health & safety procedures / inspections in accordance with osha and pennsylvania law. Supported department personnel on monthly postings and any miscellaneous projects. Summary : A highly motivated and experienced Junior Accountant II with a verifiable record of accomplishment spanning 10 years. Highly creative, recognized as a results-oriented and solution-focused individual. Areas of strength include Accounting/Bookkeeping Data Entry, Receipts, & Invoices, Month-end Reconciliation & Analysis, Payroll (Enter & Balance) Accounts, Payable/Receivable. 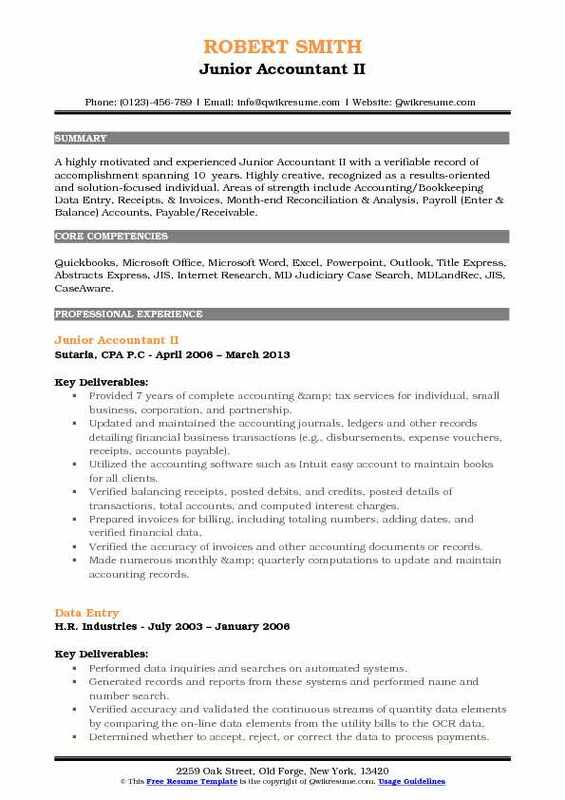 Skills : Quickbooks, Microsoft Office, Microsoft Word, Excel, Powerpoint, Outlook, Title Express, Abstracts Express, JIS, Internet Research, MD Judiciary Case Search, MDLandRec, JIS, CaseAware. Provided 7 years of complete accounting & tax services for individual, small business, corporation, and partnership. Updated and maintained the accounting journals, ledgers and other records detailing financial business transactions (e.g., disbursements, expense vouchers, receipts, accounts payable). Utilized the accounting software such as Intuit easy account to maintain books for all clients. Verified balancing receipts, posted debits, and credits, posted details of transactions, total accounts, and computed interest charges. Prepared invoices for billing, including totaling numbers, adding dates, and verified financial data. Verified the accuracy of invoices and other accounting documents or records. Made numerous monthly & quarterly computations to update and maintain accounting records. Investigated questionable data and recommend actions to resolve discrepancies. Operated office equipment including personal computer, copiers, fax machines, scanner, and 10-key calculator. Read and utilized the equipment manuals and procedures to establish common usage best practices. Maintained telephone and personal contact with clients and vendors on receivable matters. 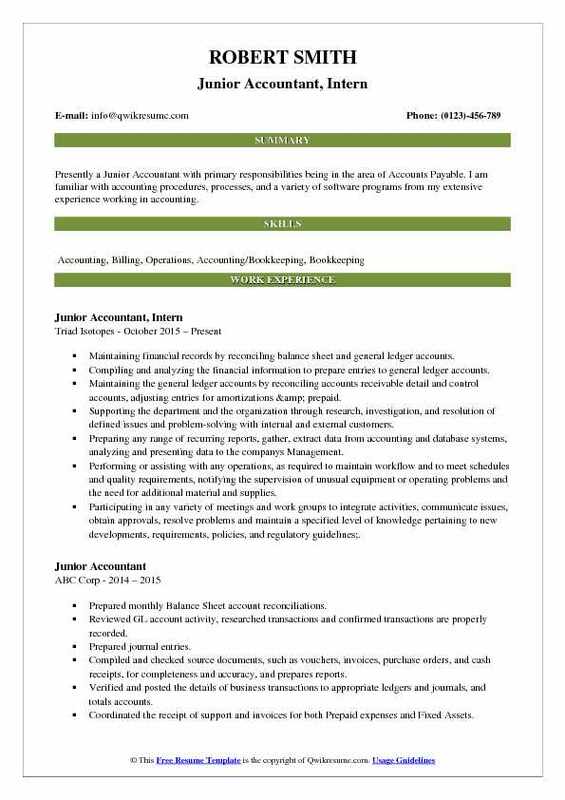 Objective : Junior Accountant Intern with 3 years of experience is seeking a challenging position that will enable growth while utilizing my existing skills in Accounting, Commercial Collections, Customer Service, Data Management and related areas. Reviewing operation room logs and entering correct inventory into order in Microsoft Great Plains. Confirming all patients on logs received services and all patients who received services are present on logs. Investigating and resolving any discrepancies with operation room logs or revenue received from services. Posting revenues by verifying and entering transactions from surgical center deposits. Reviewing and determining if patients accounts require debit or credit memos. Then entering the memos accordingly. Reviewing the refund requests, determining if the refund is required and all proper documentation is submitted. Correcting any distribution errors missing in orders being posted to general ledger. Assisting the surgical centers with any and all accounting discrepancies and errors related to revenue. Training the employees in accounting and surgical centers in daily responsibilities and company policies & procedures. Resolving all issue and errors before the end of month process is completed. Objective : Junior Accountant with 3 years experience accountant who possesses the ability to analyze data, define problem areas, draw logical conclusions, analyze situations accurately and adopt an effective course of action. Who is accustomed to the pressure of tight deadlines and possesses the ability to excel in a fast-paced environment. Manifest capacity to manage numerous projects concurrently. Able company spokesperson who always presents an image that will promote the company. Performed the processing duties of accounts payable including liaison with vendors and staff to ensure prompt payment of invoices. Acknowledged by the company as a resource person who recognizes the monthly activity in each invoice. Analyzed, audited and researched hundreds of invoices each month while directing the administration of all invoices. Verified completeness and accuracy of data and documentation for invoice data entry in order to facilitate month-end closings. Provided quality service by furnishing accurate information, researching, resolving issues and providing all necessary assistance on a timely basis. With an understanding of accounting principles and concepts, assisted in month-end closing procedures and reconciled the month-end accounts payable trial balances and bank statements. Utilized excel, prepare a monthly list of all payable transactions to submit to the owner for review. Assisted the controller with the end of month closings and special projects.